A growing world population, dwindling agricultural resources and rising concerns about climate change are adding pressure to an already strained global food system. With global hunger on the rise after declining for over a decade, it is clear that countries, companies and individuals must reassess approaches to food production and consumption. In this context, the annual Chatham House Food conference will explore practical solutions to build a more resilient food system and feed the global population sustainably, focusing on the responsibility of key actors in achieving these goals. FAO celebrates World Food Day each year on 16 October to commemorate the founding of the Organization in 1945. Events are organized in over 130 countries across the world. These events promote worldwide awareness and action for those who suffer from hunger and for the need to ensure food security and nutritious diets for all. World Food Day is a chance to show FAO’s commitment to Sustainable Development Goal (SDG) 2 – to achieve #ZeroHunger by 2030. The Norman E. Borlaug Inetrnational Symposium, known informally as the “Borlaug Dialogue,” each year brings together over 1,200 people from more than 65 countries to address cutting-edge issues related to global food security and nutrition. The three-day conference convenes a wide array of scientific experts, policy leaders, business executives and farmers. Through the Borlaug Dialogue, the World Food Prize Foundation helps build alliances in the struggle against world hunger and malnutrition. The theme for 2018 is “Rise to the Challenge”. Below is an excerpt from an article by Ms Esin Mete, President of the International Fertilizer Industry Association (IFA), which discusses the potential of fertilizers biofortified with key micronutrients, such as zinc, iodine and selenium to improve crop yields and resilience, while also making these micronutrients more available to humans when we eat them. 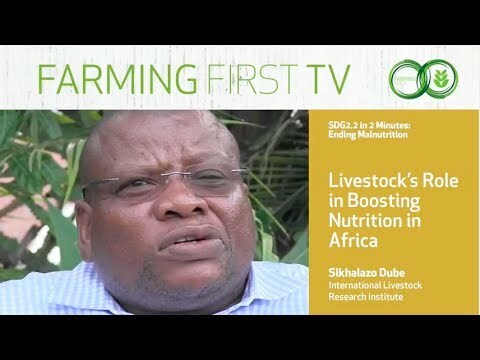 Read the full article by visiting the Global Food Security blog. Improved nutrition not only extends and improves people’s quality of lives but also plays a significant role in boosting their productivity and sustaining a healthy economy. The UN Food and Agriculture Organisation estimates that malnutrition alone costs the global economy around $3.5 trillion dollars each year (around 5% of global GDP) due to lost productivity and healthcare costs. 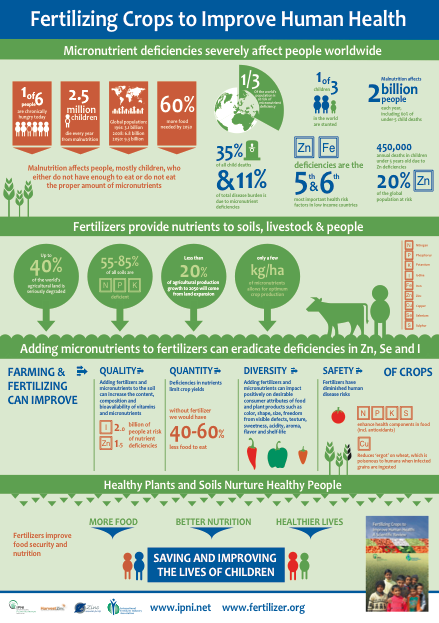 One way my sector can help is to better understand the potential roles that fertilizers can play to tackle hunger and malnutrition. Evidence shows micronutrient fortification of fertilizers – that’s adding selenium, zinc or iodine to the nitrogen, phosphorus and potassium usually present – can offer promising results, and not only in the developing world but in the developed world as well. In my home country of Turkey, a zinc fertilization programme on wheat in the Central Anatolian region resulted in as much as a 500% increase in crop yield, lifting economic returns by around $150M per year). 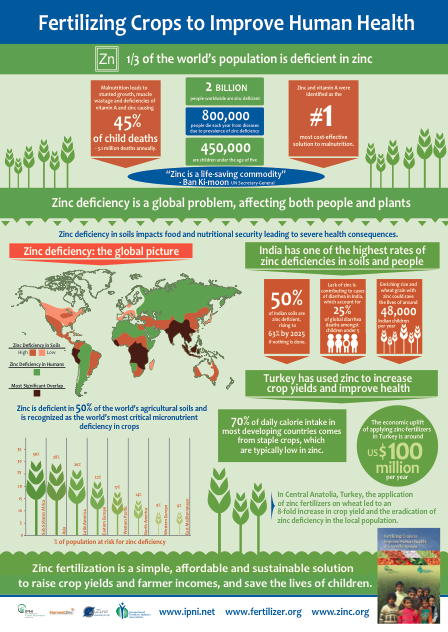 The application of zinc fertilizers in Turkey also led to the eradication of zinc deficiency among local people. Since crops were able to absorb zinc from the soil, they also had more bioavailability of zinc for the humans who consumed them. The complexity of the challenge we face demands a coordinated effort. Micronutrient fertilization is not the only solution, but in my view it does offer a simple, cost-effective and sustainable way for improving food and nutrition security. Read the full article by visiting the Global Food Security blog. Download the scientific review on which this article is based, “Fertilizing Crops to Improve Human Health“. The International Food Policy Research Institute (IFPRI) has launched a new book entitled “Reshaping agriculture for nutrition and health”. Originally the policy briefs for the conference “Leveraging Agriculture for Improving Nutrition and Health,” facilitated by IFRPI’s 2020 Vision Initiative in India one year ago, this book compiles revised edits from leading experts, practitioners and policymakers on the links among agriculture, nutrition, and health. Much of the rhetoric around agriculture centres on production – the need to increase yield and output. This book reinforces the need to recognise agriculture’s deeper purpose – to grow healthy well-nourished people. One of farmers’ most important tasks is to produce food of sufficient quantity (that is, enough calories) and quality (with the vitamins and minerals needed by the human body) to feed all of the planet’s people sustainably so they can lead healthy, productive lives. This is effectively one of the goals of agriculture, although it is rarely made explicit. In order to meet this goal, the book argues that the agriculture, nutrition and health sectors should work together, yet they are currently working in isolation. 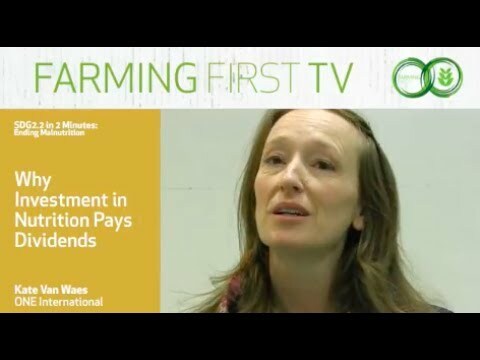 They examine how much more agriculture could do to improve human well-being if it included specific policies, actions and interventions to achieve health and nutrition goals; what kinds of changes would maximize agriculture’s contribution to human health and nutrition; and how could human health and nutrition contribute to a productive and sustainable agricultural system. Several areas are explored by the various authors, including: the specific roles played by economic and agricultural growth, innovations in crop science and food supply chains, the health of agricultural labourers, agriculture associated diseases, women’s place at the intersection of the three sectors in question and the challenges of advocacy and policymaking. 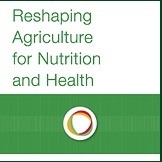 To read the full document “Reshaping agriculture for nutrition and health”, click here.